Conservative Boomerang | Back Page | Style Weekly - Richmond, VA local news, arts, and events. The last thing liberals needed was four more years of high-minded ineffectiveness - followed by a Republican restoration under someone far more conservative than John McCain. 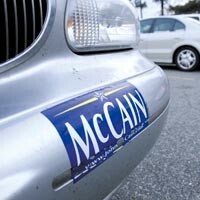 Sometime in February 2008, I wiped the road salt from both bumpers of my car and carefully centered a Sen. John McCain sticker to each. This fore-and-aft display survived dismayed comments from many friends, McCain&apos;s dismal post-nomination campaign — even his selection of Sarah Palin as his running mate. That they remain almost nothing to do with McCain&apos;s current political activities. Having lost his final bid for national office, the senator has swerved significantly toward the views of his only remaining constituency, the people of Arizona. The stickers remain for one reason: President Barack Obama has yet to convince this liberal to peel them off. On May 28 2008, in this space, I offered an essay entitled “A (Liberal) Case for McCain,” an argument grounded more in the logic of history than in the emotions of the moment. At the heart of the piece was a prediction that the president elected in 2008 would find himself hamstrung by two wars, a bad economy, declining revenues and the need to clean up the mess left by George W. Bush. So burdened, the incoming administration would be “more janitorial than transformational.” Barring the miraculous, the president elected in 2008 would not likely win a second term. A seasoned senator like McCain — with a long legislative record of constructive bipartisanship — seemed to me a better bet for the short term than a veritable novice like Obama. For the long-term, a President McCain, followed by a progressive Democrat, was better than an Obama administration followed by the likes of Newt Gingrich. Moreover, Obama struck me as a fourth consecutive iteration of the Democratic Party&apos;s inexplicable tendency to fall in love with appealing outsiders who campaign well — but lack the experience, inside knowledge and sheer toughness to govern effectively. In my lifetime, three such Democratic presidents — Kennedy, Carter and Clinton — proved incapable of working with that most intractable of opponents, a Democratic Congress. None left a liberal-progressive legacy remotely comparable with the record of that uncharismatic, unlovely but experienced — old arm-twister, Lyndon Johnson. The last thing liberals needed, in my view, was four more years of high-minded ineffectiveness — followed by a Republican restoration under someone far more conservative than John McCain. I would have dearly loved for Obama to have proved me wrong. Instead, he has proven to be a president right out of the Kennedy-Carter-Clinton mold — with a distressing hint of Woodrow Wilson&apos;s dreamy internationalism thrown in. The health-care quagmire is symptomatic. Having run on the issue — and with Democrats in complete control of Congress — Obama took office positioned to enact something like universal health coverage in his first year. All he needed was a clear, simple plan around which his millions of supporters could rally — and some hard-nosed, Oval Office sit-downs with a handful of reluctant Democratic legislators. Instead, he called a summit with the pharmaceutical companies, the hospital barons and other powerful interests — the very people with everything to lose under genuine reform — and worked out a deal they could support. Then, having given away the better half of reform, Obama asked Congress to draft the legislation — guaranteeing months of tedious hearings resulting in something more like a Rube Goldberg contraption than a simple, comprehensible plan. In doing so, Obama lost the battle of ideas. As negotiations dragged on, his friends could never be sure exactly what they were being asked to be support — while every ill-considered amendment furnished a talking point for the AM radio ranters. Finally, as opposition mounted, Obama backed off a public option — the only possible means of achieving both meaningful cost-control and anything like universal access. In short, Obama violated a rule the allegedly unintelligent George W. Bush understood well: Obama negotiated with himself. Instead of starting with a simple, bold plan and negotiating hard, yielding ground reluctantly, he began with compromising with himself, then sat by as the interest groups whittled this compromise to practically nothing. Moreover, he made almost no use of the powers of incumbency. Instead of imposing party discipline on blue dog — or is it Blue Cross? — Democrats, Obama managed to split his own party three ways while endangering the re-election prospects of dozens of congressmen he&apos;ll need to retain control of the House of Representatives after 2010. The health-care mess is merely the most celebrated of his rookie mistakes. Across the globe, Obama has been uncomfortably friendly with America&apos;s adversaries, and far too reliant upon rhetoric alone to resolve intractable disputes. He&apos;s been dilatory on getting aid to the Gulf Coast, putting the Guantanamo detainees on trial, and ending “Don&apos;t Ask, Don&apos;t Tell” — and has utterly dropped the ball on extending the Kyoto protocols. Having spent money like a drunken sailor, he&apos;s put the dollar at risk of losing its status as the world&apos;s reserve currency. All the while, the president has talked and talked — and talked. Yet most of his talk sounds like campaign rhetoric — long on hopeful goals, but desperately short on ways and means. And he&apos;s starting to run out of time. Next week, barring the unforeseen, Virginia — a state Obama carried — will elect three Republican statewide officials, headed by a product of Pat Robertson&apos;s Regent University. Already, there is talk of Republicans regaining control of the House of Representatives in 2010, which would doom Obama&apos;s agenda. And leading conservatives are salivating at the prospect of running against the president in 2012. &apos;Rick Gray is a former history teacher, local actor, blogger and beekeeper.